Your silver Washington quarters value has a base price of $2.80 . With the value of silver in the $14.90 per ounce range the high silver content in your quarter raises its collector worth to $2.80 . Most of your circulated coins - coins that show signs of wear - fall into this price range. However, the earlier coins, minted 1932 through 1940 are valued higher as a collectible in circulated condition. The two coins you are hoping to find in your group are the 1932-D, in heavily worn condition it is worth $41. The other is the 1932-S, a $43 coin in "Good" condition. Two more exciting finds, should you have them, are the 1935-D or even better, the 1936-D. In higher grades these Washington quarters value easily climb to over $25 to $53. Higher grades, yes, collectors focus on obtaining "Uncirculated" crisp, bright, like new, coins for their collections. The uncirculated silver Washington quarter pictured is an outstanding example worth a premium. See below for more about how to "Grade" the condition of your coins. Earlier dates and high condition. This one-two combination is what gives Washington quarters value. Sort through all your quarters, pull out the nice ones and discover their values. The above are wholesale Washington quarters value. Computed from dealer's price lists with various mark-up factors figured in. They reflect closely the value you would expect to receive when selling. You can expect variations in value to occur subject to subtle grading points, collector demands and dealer needs. For more background information, see how value listings in the above Coin Value Guide are determined. The condition or state of preservation has a large impact on Washington quarters value. A heavily worn "Good" condition coin is not as desirable as one in "Uncirculated" or brand new condition. The highest value coins are always the top grade uncirculated ones. 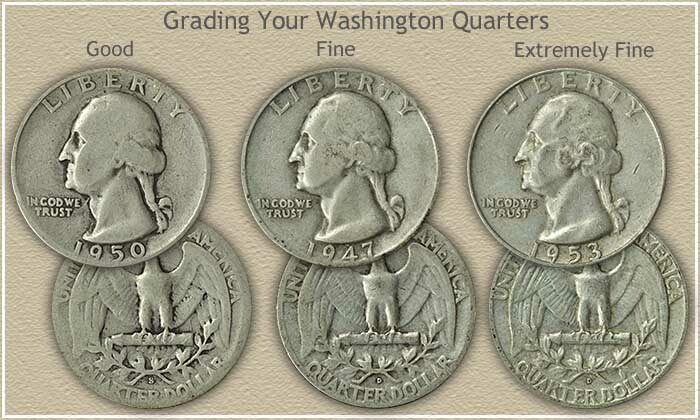 To determine your Washington quarters value, compare your coins to the grading image below. Separate out the well worn coins, then assign a grade to your better looking coins. After this you are ready to check the coin values chart. As you grade your quarters, focus your attention on the rim of the coin. A full rim and some hair detail on Washington separates a coin in "Fine" condition from one in the lower "Good" condition. A coin with sharp detail, only traces of wear, and some mint luster approaches the "About Uncirculated" grade. These coins have the potential of higher collectible value. 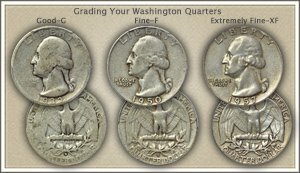 Are some of your older Washington quarters in very nice condition and you are not sure what grade to assign? If the values approach $100 or more, it makes economic sense to seek the help of a grading service. See the video: Grading Washington Quarters and follow the process of judging condition and confidently separate the bullion value coins from the premium collector pieces. Some things you can do, are check a few rare coin dealers and auction listings. Look for those offering Washington quarters for sale. Their listings usually include a notation of the NGC or PCGS assigned grade. The descriptions of the coins indicate the characteristics giving Washington quarters value. Additionally... these coin dealers are potential buyers of your coins. Mintmarks on quarters are easy to locate. The Denver Mint placed a small "D" on the reverse just below the wreath. The "S" mintmark indicates the San Francisco Mint produced the coin and was placed in the same position. 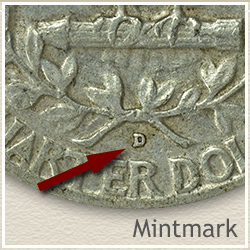 The Philadelphia Mint did not use a mintmark on the early silver Washington quarters. If collecting in a serious way is not for you, one successful approach is to sell all your coins and use the proceeds to buy one nice rare coin. Perhaps an appealing, bright uncirculated quarter from the 1930's or 1940's. The one you were hoping to find in the box. Pass the thrill of a rare coin on to your children. Even though most silver Washington quarters value is tied directly to bullion value, these coins are becoming very old. The early dates, even in lower grades are gaining in value above silver. Additionally, millions have been melted for the silver content reducing the supply. Today, the publicity of the Statehood and America the Beautiful Quarters has drawn many new collectors, adding to the demand. The older coins are sure to benefit. Check back as needed and definitely before you sell to stay current with silver Washington quarters value. Washington Quarters: Of importance to grading Washington quarters is identifying and separating the minimum silver value examples from the higher collector value coins. Video plus close-up images and detailed descriptions help judge condition and assign a grade. Print the Coin Values Worksheet - link in navigation column - to list your Washington quarters and record their values. Should you decide to sell... use the worksheet as an invoice and packing slip when sending coins through the mail to dealers. It indicates you have done your coin values homework.